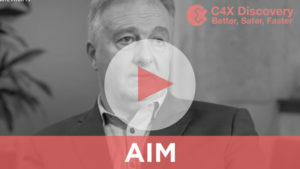 We recently filmed Clive Dix who gave us an overview of C4X Discovery (LON:C4XD). C4XD are an AIM listed business which develops technologies for use in drug discovery. A product called Taxonomy 3 identifies genes associated with disease. A second technology called Conformetrix identifies molecules which will work against those proteins. The company use data mining, learning technologies and recently released a virtual reality product which helps chemists visualise molecules and proteins. C4X develop molecules to the point where they can be licensed, rather than takin them to the clinic themselves. Using this deal format, they recently signed a deal with Indivior which provides a $10m upfront payment with the potential for a further $284, based on milestones.